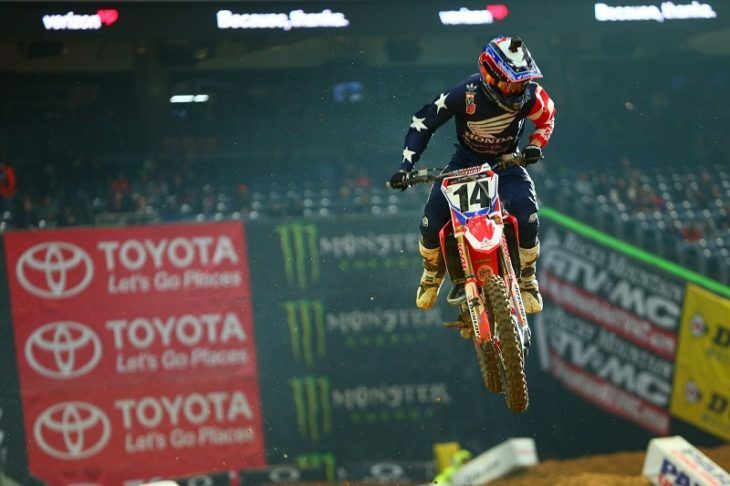 HOUSTON (January 13, 2018) – Troy Lee Designs rider Cole Seely made great improvement from his opening round result, finishing the race inside NRG Stadium just off the podium in fourth. His solid performance helped propel Seely to fourth in the championship standings, just six points back of the tie for second. The first football stadium of the year came rather early in the season for 2018, but it was well received by most riders. Seely didn’t waste any time to improve upon his Round 1 results, scoring second in the Heat Race and proving he was ready to battle in the Main Event. When the gate dropped in the Main Event, Seely found himself with the front runners and kept with the lead pack for the opening laps. He kept pushing and found himself as high as third before finishing the race with a season-best fourth.